This is the third post in my series on the handling of drug related charges in Peoria, Illinois. My last article focused on search and seizure issues which often arise in narcotics cases. It is important to understand that the charges may be dismissed if it can be shown that officers violated your rights. 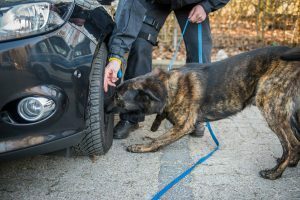 In this post I will discuss another important topic – whether law enforcement may use a drug sniffing dog to locate narcotics. If you feel that your rights have been violated then it is important that you contact a criminal defense attorney immediately. The United States Supreme Court clarified the law, in regards to drug sniffing dogs, in 2014. In the case of Rodriguez v. U.S. the Court held that police may use a canine to sniff for illegal narcotics but in doing so may not detain the driver longer than they normally would under the circumstances under which the driver was stopped. In other words, if the driver was stopped for speeding then law enforcement would only be able to detain the driver for the time necessary to issue a citation. Under Rodriguez a person’s rights would be violated if police stopped them for a traffic infraction, and due to a belief that the person may be carrying drugs, forced the person to remain at the scene for a drug sniffing dog to arrive. Under such a scenario any drugs found could be excluded from evidence due to a violation of the Fourth Amendment. Depending on the circumstances this could lead to a dismissal of the case. Rodriguez represented a change from the way such cases are normally handled. Prior to the Court’s decision, police could force a driver to remain at the scene and wait for a drug sniffing dog to arrive. It is important to understand that, while the law has changed, it is up to the defendant to challenge the admission of unlawfully obtained evidence. If the police violated your rights then evidence obtained will typically be admissible unless you properly challenge it in Court. This requires the filing of a Motion to Suppress Evidence and conducting an evidentiary hearing. This can be a complicated process and if it is not handled properly then the evidence may be ruled admissible. Hiring an experienced criminal defense attorney can help in ensuring that the matter is handled correctly. I am a Peoria, Illinois lawyer handling drug cases throughout the area. I am a former prosecutor and am very familiar with the workings of our local legal system. If you believe that police violated your rights through the use of a drug sniffing dog then contact my office today to schedule an initial consultation. I also service the cities of Bloomington, Eureka, Galesburg, Morton, Normal, Pekin, Springfield, and Washington, as well as the counties of Fulton, Knox, LaSalle, Marshall, Mason, McLean, Putnam, Rock Island, Schuyler, Stark, Tazewell, and Woodford. I also handle federal cases in Urbana.